There’s a new bus in town: Bus X81. What is so special about it ? Bux x81 starts from - Ruwais ADNOC Compound – and after 2 hours and 50 minutes it will arrive in Abu Dhabi International Airport (AUH = IATA airport code). You will have a 10 minute stop in Tarif. It is recommended that get off the bus and strech your legs. You could also get some snacks or drinks from the shop inside. We want to mention that the Tarif bus station also has a prayer room and bathroom. How much is the ticket price ? The ticket price is 35 AED, the same as Ruwais -> Abu Dhabi. Make sure you get on the right bus in Ruwais, because there is no price difference between going to the AUH and Abu Dhabi Main Station. In case you do get on the wrong bus, you can get off at Tarif or Mussafah bus station and continue to your actual destination. Here is the Bus schedule from Ruwais -> to -> Abu Dhabi International Airport. If you remember the hours mentioned before just subtract 15 minutes. Hours of departure from AUH are : 06-15, 10-15, 14-15 and 18-15. Nice info, especially for those who has flight time match with this bus timing. Good idea..but it would be better if the bus will go around inside the housing area because most people who’s going to the airport has their heavy luggages and boxes.So for them to be pick up infront of their buildings is much more convinient.Thank you for your effort and maybe you can consider my suggestion. so need icad to AUH airport….. If possible change timing of last trip. It should be on airport between 2000 to 2015 Hrs. So Indian People can catch flight to Mumbai,Chennai and other places. 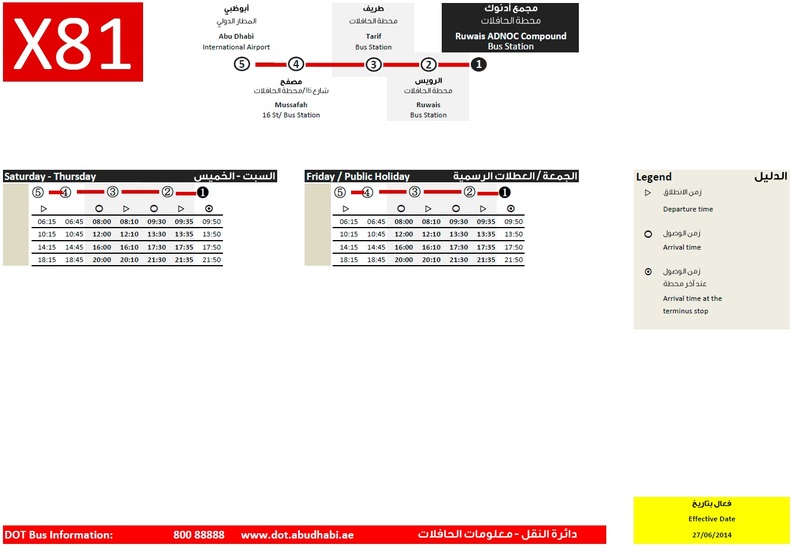 Is this bus schedule only from Ruwais to AUH Airpot OR Return also ? Hours of departure from AUH are : 06-00, 10-00, 14-00 and 18-00. Good evening krupesh. In the future please take into consideration the X81 bus timing schedule before making airplane reservation. The schedule of the X81 BUS was designed to accomodate main hours of flight departures and bus drivers schedule of work betweet 6 AM to 10 PM. If you can get the indian community to backup your request please consider contacting the Department of Transportation : http://dot.abudhabi.ae/en/info/contact_us as your collective claim can make the change possible. Excellent facility for those who save the time. will this bus stop at Almaria? Assume that the bus schedule does not hit a snag like breakdown along the way. Heading towards airport takes high risk because you can not be late for check in. Going back to Ruwais is less risk… if bus is late or broke down, can still arrange for other transportation. So, planned to go airport from Ruwais hours in advance. Better to be prepare to take extra back up waiting hours to deter late arrival. Remember recent rain caused journey from Ruwais to Abu Dhabi double the time…. really appreciate all the efforts put in my you all. I took the bus service n liked it. i didnt have to travel to the city to catch a bus to ruwais. However i noticed that not many people know of this. There were people going to Ruwais, but didnt know of this bus. I was the only one to board the bus from the airport. I asked the information desk at the airport and the taxy drivers. No one seemed to have any information about this bus. I believe more advertising needs to be done! Where do we board the bus at the airport? 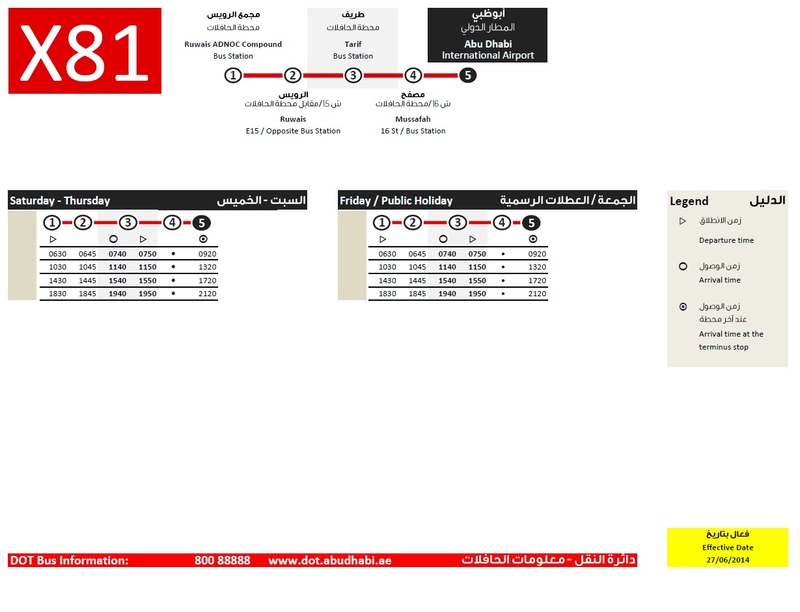 The bus schedule is every 4 hourly, begins from 6 am daily, begins from AD bus station. Must check with AD department of transportation, or check their website. When you arrived at the AD airport, exit main arrival hall (or lobby) lobby into car park bay right in front of you. There is two locations where buses could be seen passing right in front of the main lobby. On the right is free shuttle airport bus service to AD downtown city that will drop folks at designated hotels (or/and malls). Proceed to the left side of the main road. Look for bus stop signage that exhibit X81 bus route. The bus is huge white with red strip written all over. The bus will takes you to Musaffa bus station, Tariff bus station, Ruwais bus station (junction of Ghayati road) and finally inside RHC bus terminal. I recommend those residing inside RHC to use this to commute. For those who wished to go for long journey home…. It beats the hell of paying huge airport parking fees! Where exactly is the bus stop for X81 at the Abu Dhabi Airport? Which terminal? Right in front of arrival hall exit doorway, located just to the left main road. Exit the main door and just walk less than a minute to your left. Look at the bus stop signage that display X-81 pick schedule. 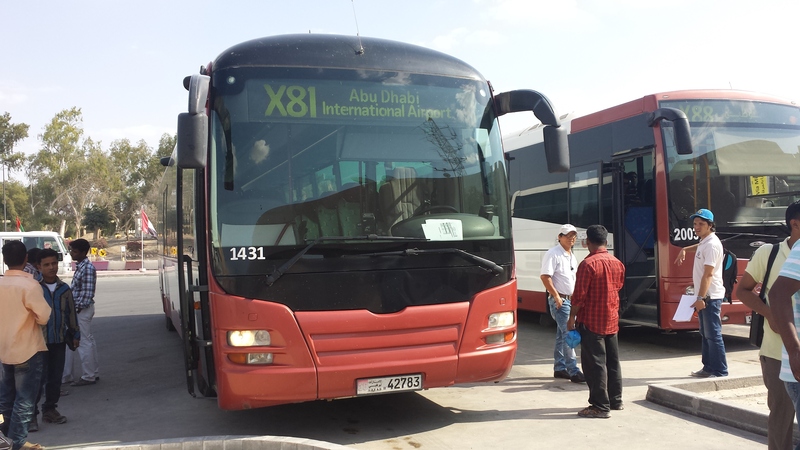 There are other buses picking up passengers to other destination, especially to Abu Dhabi. If you knew your flight arrival schedule and able to meet X-81 fixed pick up time schedule in one to two hours time, then you will have smooth travel plan to RHC. There are two factors determine everyone travel plan back to RHC. One, you have to be patience and waiting is the main game here in UAE vast desert environment and remote location like Ruwais. Two… X-81 unfortunately pick up passenger every 4 hourly. Either, just take any bus service to Abu Dhabi, or taxi, especially travel to Abu Dhabi main bus terminal, and then look for regular public bus schedule that ply AD-Ruwais route. Good luck. I just speaking or those who does not own private car, or does not wish to pay premium parking fees at the airport. Good luck. What time X81 Bus reaches at Abu Dhabi International Airport when it departs from Ruwais around 6:15 am ? Jet Airways Flight departs around 10:35 am to Mumbai from Abu Dhabi. Will it be convenient for me to catch X81 Bus and go to Abu Dhabi International Airport from Ruwais? Hi Nayan, I have been in this airport bus and it takes around 4 hours to reach airport. So i don’t think it would be advisable for you considering the facts that your flight is at 10:35 AM. hi… all, anyone travel by evening bus to airport and get boarding pass of flight to Mumbai 2230hrs. Thanks Kartik for providing me useful information. Sorry for giving your response so late. that this write-up very compelled me to take a look at and do it! sharing data, that’s truly good, keep up writing. Hi. Is the bus timing schedule is still accurate until now? I want Contuct number of ruwais bus stetion. I want go to airport on 24 November. We are 3 people want to go airport on 24 November. This is My contact number -0567103672.we live at gayathi al jaber camp. plz sand information tariff bas station to abo dabhi airports.my flight timing abu dhabi to Islamabad .mid night 2 clock . with in one day reply me . What is timing for bus from Ruwais to Abu Dhabi airport at evening? 6:30 pm or 6 pm? Payment possible from nol card? Please can you tell me tariff to (auh) airport bus timing.